One of the most famous royal photos ever taken was that of the unexpected kiss shared by the newlyweds on the balcony of Buckingham Palace. Until then, royal romances were sealed with a kiss behind closed doors but the world wanted a smacker to savour and the bride and groom obliged. The Queen pretended not to look, the page boys pretended not to laugh and everyone else sighed. It is an iconic image of royalty that will be celebrated forever. OK, it was crinkled. OK, it was huge. But it was a dress of fairytale proportions and the sight of Diana climbing the steps of St Paul's in that cream Emmanual frock was a moment of history. She walked in the footsteps of just a handful of women who had come to the altar to marry a Prince of Wales. And she looked just like a princess from a story book walking towards her destiny. Even the hardest heart melted at the sight of Diana's dad, the Earl Spencer, taking his daughter's arm and walking her up the aisle. Recovering from illness, he stood tall and he couldn't have looked more proud. His delight in his daughter just increased as they made that famous journey to the altar of St Paul's to the strains of the Trumpet Voluntary. It was one of the most emotional moments of the whole day. There was emotion of another kind for one guest. 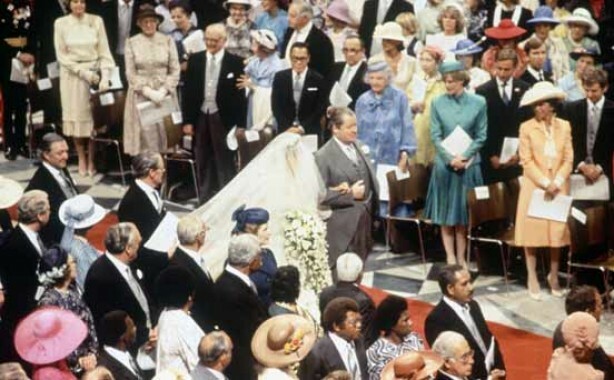 Camilla Parker-Bowles was at the wedding and wore white - no one really noticed at the time but the photo of her watching Diana walk past in her bridal gown is now one of the most well known royal images of all time. 6. Man and wife Hindsight is a useful thing. In the years since they emerged into the July sunshine as husband and wife plenty have suggested that Charles looks reticent on the steps of St Paul's while Diana looks worried and nervous. With another ending, perhaps those layers of messages would never have been placed on the photo of the new Prince and Princess of Wales. Now man and wife, the royal couple travelled through the streets of London to a rapturous response and Diana relaxed visibly as she made her way back to a palace, now a princess. The crowds were huge and they all wanted to see the bride - it was the beginning of a stellar royal career. The group shot at this royal wedding takes some beating. With the ladies lined up in the front row and crowned heads packing out the middle, this was a portrait of royalty in the 20th century at the most famous royal event for decades. Whatever your thoughts on the dress, there's no doubt that Diana was a beautiful bride and the official portraits showed a young and very happy woman. The image of the royal couple with their attendants that day had a personal touch that made it stand out from the others. 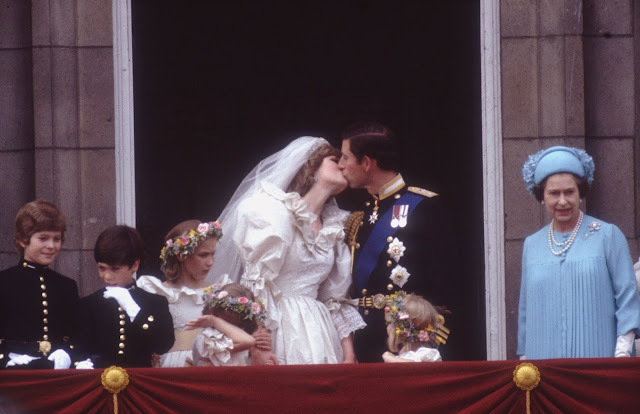 Before THAT kiss there was the chivalrous moment Charles kissed his new wife's hand on the balcony of Buckingham Palace. Given that full on smackers wouldn't become a tradition until these newlyweds started the trend moments later, this peck on the knuckles was romantic and racy all at the same time. But it underlined the romance of the day. We know how it ended but these images, and those that will be auctioned soon, show that there was happiness there when Charles wed Diana.